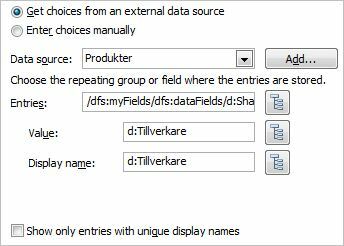 I recently had a client that wanted to show some fields in a form for end users as read only, while Managers, taking a decision, should be able to edit the same fields, all using the same EditForm.aspx. Ok, so how did I go around getting this to work? The Managers have Edit permission on the site, while end users have Contribute, this gives the Managers the list permission “Manage Lists”, which end users lacks. First thing I did was to fire up SPD locating the list and create a new EditForm, let’s call it EditForm2.aspx. I also created a new DispForm, called DispTrash.aspx (so that I know it should be deleted when I had finished my work). So we are wrapping the fields with a Security Trimmed Control and a table. this will give the result that the code inside this Control will be hidden for end users. Let’s open DispTrash.aspx in SPD, locate the same fields that you wrapped inside this Security Control. Copy the rows and make sure you get the starting <tr> of the first field and ending </tr> of the last field, so that the HTML don’t get messed up. Paste this code right after this table’s starting tag. </table>, to close this table. Ok, so what do we have this far? We have two sets of the same fields, where some are editable and the others are display only. The editable fields are wrapped in a Trimmed Control and will only be shown for users with ManageLists permissions. This means that the table with the class “trimmedContent” only will be visible to Managers. And Managers will see both these sets of fields…this must be taken care of! This code will check if the table with the class of “trimmedContent” is present. 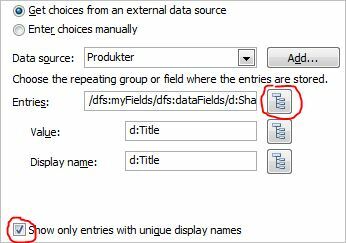 If it is, it means that the user is a Manager and we choose to hide the table that contains the display only fields. My hope is that this will help someone. I had a client a little while ago that had this requirement. In a list it should be as simple as possible for the users to add a link to a media file that is located on a file server. They did have a mapped net work drive and they were only connected to their Intranet while at office or through VPN. My first thought was to add a default value to a URL column so that they only had to add the last part, but that was not possible. Then I tried to add the default value to a text column and that worked if it was an http-link but not a file-link. My friend jQuery came to rescue and offered me a solution that came to be like this. The idea is that the user, besides adding a few other things in this form, only should have to add the file name and file type e.g. “MyMovie.mov” in a field to build a link to the file on the server. First I added a new column “MediaLink” of the type URL. This column should be set to be hidden in the forms, but do that a little bit later. Then I added a new column “MediaFile” of the type Text with a description of what they should be adding, name and type. So, simply add this code to a file called “media.aspx” and put the file in “SitePages”. Be sure to change the variables “drive” and “folder” so that they fit your environment. I had a talk to Marc D Anderson about this and he gave me a few ideas that I will try to improve this further. When I have, I will update this post with these improvements. CU in Vegas in a couple of weeks! Ok, as the title says I will describe and show you have you could do to give your InfoPath form that little extra that sticks out. As you already might know we now have the possibility to use pictures as buttons in InfoPath 2010. It consists of six pictures altogether, because we have a darker image that will be chosen as hover-button and as the active-button. We also have three views that we can toggle by selecting these tabs. The tabular area is divided in five cells, a starting and an ending cell and three cells that holds each one of the tabs. The starting and ending cells both have a background color of RGB: 192, 210, 218 and the cells in the middle have RGB: 205, 219, 225 that will match these pictures. Putting a background color also gives a smoother transition when you hover the buttons. 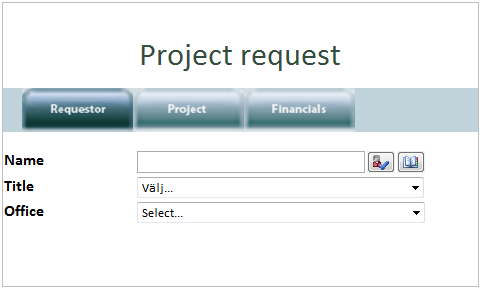 Start by creating three views named “Requestor”, “Project” and “Financials”. For each one of the buttons and cells, set all margins to 0 (zero) so that looks like this. Now choose the first view, in this case “Requestor” and give the home-button the darker picture and leave the hover button empty. As you can see InfoPath gives the picture a name of its own. For the other two buttons in this view, add the brighter picture as its default and the darker as the hover button. When you have finished all three buttons make a preview to make sure the tabs change when you hover them. Now we are going to add some rules to the buttons. On the view “Requestor” leave the first button as is. On the second button add a rule with an action that switches to the view “Project” and on the third button an action that switches to the view “Financials”. Now do the same thing for the other two views but of course, have their home-buttons dark without a hover button and so on. Make a preview and make sure you end up in the correct view. I would like to start with a small and quick one. 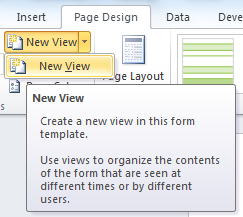 Let’s say you have a drop down (field2) in your form that lists objects from a list in SharePoint. The list has got two columns, Title and Number. The value for the drop down is set to Number and the Display name is set to Title. 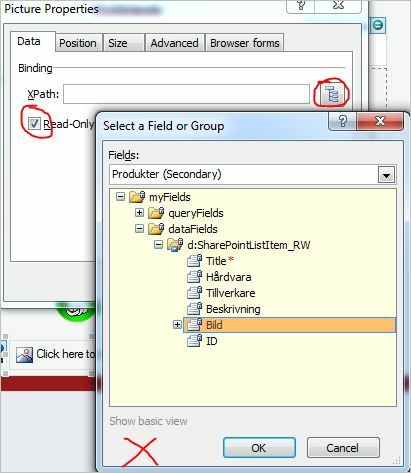 Then you need to set another field (field3) in your form to the value of the chosen object,. that’s when you will see that the number of the object will have lots of trailing zeros. An easy way to get rid of these zeros is to insert a formula in front of the field2 value of sum. this way the zeros will be gone. I would like to show you how to work with lookup columns between lists when you i.eg. would like to summarize the amount of orders that a sales person have made. So we have a list called “Sales persons” with five columns, “Name”, “Region”, “Office”, “Sales ID” and “TotalAmount”. We also have a list called “Sales orders” with three columns, “Product”, “Amount” and “Sales ID”. In this list the column “Sales ID” is a lookup column to “Sales ID” in “Sales person”. 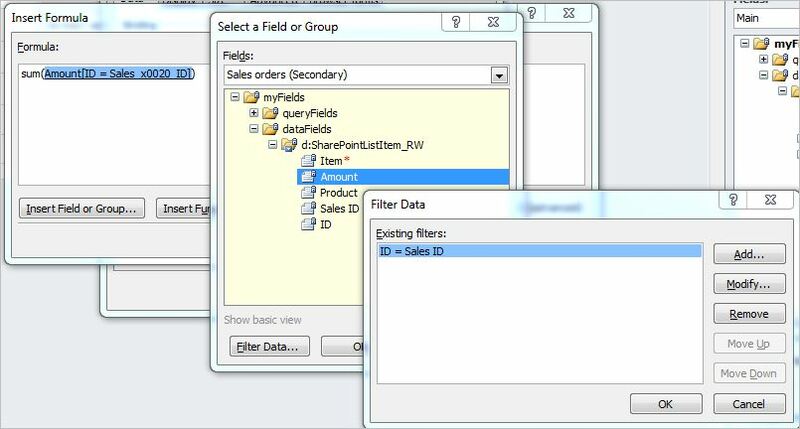 We also have a data connection to retrieve these three fields from “Sales orders”. When we open a form for a sales person we want to see the total amount of orders that’s been made by that person. When we first look at this it looks quite simple. The “TotalAmount” should be the sum of “Amount” where “Sales ID” equals “Sales ID”, right? The problem here is when we work with lookup columns it is not actually the value of the look up that is brought to your repeating table by your data connection, it is in fact the “ID” of the item in that list. The “TotalAmount” should be the sum of “Amount” where “ID” equals “Sales ID”. Now when we open the form of a sales person, we could see the total amount that person has sold for.